Back to makeup. Jessi has all sorts of beautiful colors in her wedding flowers so we wanted to keep the eye simple with a red lip and that is exactly what we did! Here is her final look. BABs is in the wedding wearing a beautiful champagne/taupe dress so we went with a bit of sparkle. Here are the details on BABs look…. I recently had the wonderful opportunity to partner with Pamela Williams Photography and do the makeup for a stylized bridal shoot. I was so excited to be asked along with other local businesses involved like Flowers on Broad, The Marion Hatcher Center and House of the Bride. I also got to meet the sweetest model, Jordan. Another day of fun in my studio with a new client, Brianna! Brianna is getting married and wanted a new dramatic look for her wedding day. When she got to my studio, we discussed everything about her look that she wanted. She showed me pictures of what she loves and doesn’t like. (Did you know that what you don’t like is just as important as what you do like?). We talked about her dress, her wedding colors, and her hair. This way, I can create a cohesive look for her wedding day. Here is her final look…..
I’ve also created a face chart to go along with Brianna’s look…. I was so excited when these two made an appointment for Jessie’s bridal trial and a trial for her mom too! We got everyone relaxed and had a great time! Jessie wasn’t too sure of what she wanted for her big day, so I created a soft, contoured eye with a bit of smoke using the colors in her wedding….navy and pink. Of course, you all know me, so it wasn’t only those two colors to create her look but that is what started it. For the wedding, we will also add false lashes to complete the look. For Linda, the mother of the bride, we stayed with a simple and polished look for Jessie’s big day . . . radiant skin, classic eye, topped with lots of mascara, and a pink/slightly berry lip. 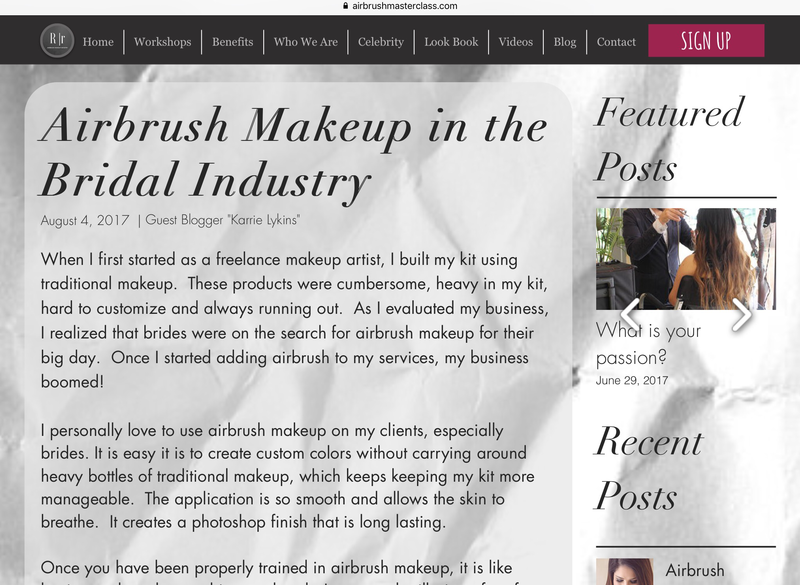 I was so excited when Robbie and Ramon asked me to be a guest beauty blogger for their website, R & R Airbrush Makeup Artistry. Check it out here! As you already know from my blog, I love what I do! I am extremely lucky to have such amazing, sweet and beautiful clients and the other day was no different! Katelynn, the gorgeous bride, and her sweet bridesmaids were so much fun to be with on her wedding day. On the wedding day, the bride sits in my chair and gets to take a moment to enjoy the whole process of the day without any worry! The bridesmaids get pampered as well. On each bridesmaid, I try to do different looks customized to each one. I take into consideration on what the bride wants for her wedding party, as well as what make her bridesmaids feel most comfortable.